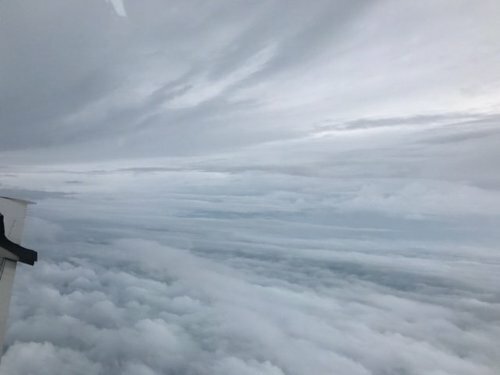 To residents in evacuation zones in Georgia and the Carolinas looking at initial reports and thinking, “‘maybe it'll turn and it won't be so bad' – you need to go now,” FEMA administrator Craig Fugate said in an interview today with ABC News' Arlette Saenz. “Many of these areas have not had this level of flooding since, like, the late eighteen hundreds,” Fugate said. And as for residents in Florida who still haven't evacuated, Fugate said it may be "already too late for some." “Just stay where you're at, hold on, because it's just too dangerous to be outside," he told ABC News. Meanwhile, FEMA has “thousands” of personnel ready to deploy if needed, according to Fugate. Georgia Gov. Nathan Deal urged residents who have evacuated their homes not to risk their lives by going back too soon. “There comes a point where we cannot jeopardize the lives of our first responders any further," Deal said at a news conference this afternoon. The governor has deployed 1,000 National Guard troops in the state as it braces for Hurricane Matthew. Four hospitals have already been evacuated and some 9,000 people are currently in shelters, Deal said. A third storm-related death has been confirmed in Florida, according to Volusia County Emergency Management. Shortly after noon, a woman in her 60s went outside to feed her animals and a tree fell on her and killed her, officials said. The other two deaths were in St. Lucie County. 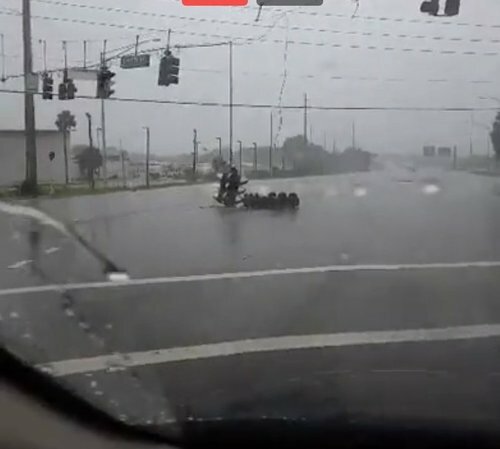 The Jacksonville Sheriff's Office posted a photo of a streetlight that swung off the wires and fell onto a major intersection. Drivers should treat intersections with broken street lights as four-way stops. 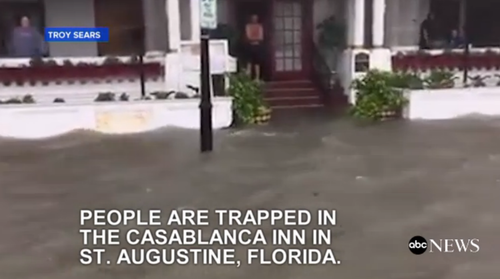 Video shows widespread flooding form the hurricane trapping people inside their homes nad businesses in St. Augustine, Florida. The damage to the pier at Jacksonville Beach will have to be assessed after the storm, said Jacksonville Mayor Lenny Curry in a press conference Friday afternoon. The pier was rebuilt about 10 or 11 years ago, he said. As the Haitian government and international aid groups work to determine the immediate toll in death and destruction from Hurricane Matthew, health care experts are worried the storm may have given rise to another less obvious threat -- a cholera epidemic. The Pan American Health Organization said it is preparing for a possible surge in cholera cases in Haiti over the next several months. "Due to massive flooding and its impact on water and sanitation infrastructure, cholera cases are expected to surge after Hurricane Matthew and through the normal rainy season until the start of 2017," the health organization said in a statement Thursday. Read more from ABC News' GILLIAN MOHNEY and CATHERINE THORBECKE here. Tropical storm warnings remain in effect from Daytona Beach to the outer banks of North Carolina. 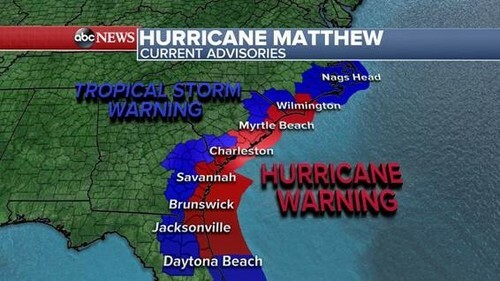 Hurricane warnings are in effect from St. Augustine to Wilmington, North Carolina. A zoo in Florida shared adorable photos showing how its animals are being sheltered as Hurricane Matthew moves up the state's Atlantic Coast. "Two days of hurricane prep is now over! Every bird and mammal is housed safely indoors, all venomous snakes are double contained (at least), tortoises and wee crocs are in various tubs and the storks are hanging out in the public restrooms! We love our animals and staff. Take care everyone and be careful," the St. Augustine Alligator Farm Zoological Park wrote in a Facebook post. Read more from ABC News' CATHERINE THORBECKE here. 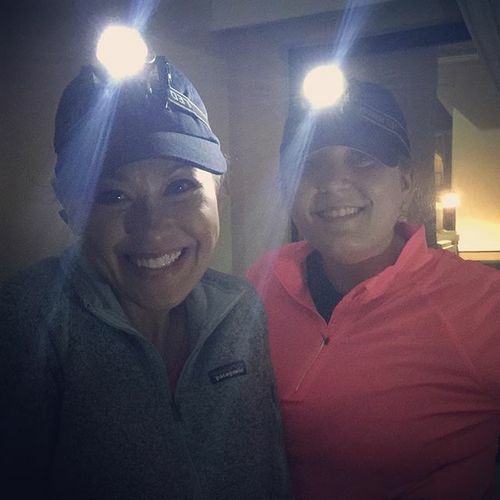 ABC News' Eva Pilgrim is currently without power in St. Augustine, Florida. The latest reports from the Florida Public Service Commission show at least 944,655 customers are without power. Strong winds and flooding rains are spreading inland across North and South Carolina this morning. The winds are now at 75 mph, making Hurricane Matthew a Category 1 storm. 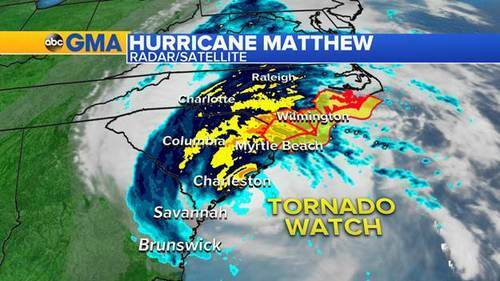 A tornado watch continues for eastern edge of North Carolina, and the northeast of edge of South Carolina. 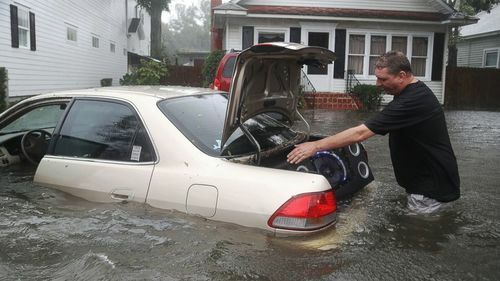 Rob Birch salvages a speaker from the trunk of his car which floated out of his driveway as Hurricane Matthew passes through the area on Friday in St. Augustine, Florida. Nassau County, Florida Emergency Management issued a "Boil Water Notice" for residents with private wells, warning against possible water contamination following Hurricane Matthew.